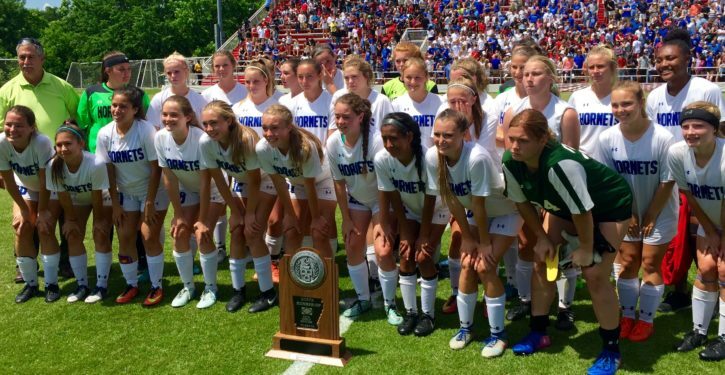 FAYETTEVILLE — The Bryant Lady Hornets had an answer for the Rogers Lady Mountaineers throughout regulation play in the Class 7A State soccer championships at the University of Arkansas Friday morning. Rogers would score and the Lady Hornets would come right back and match them. Until there was no opportunity to match them. In overtime. In the 89th minute of play, with just 1:43 left in overtime, Rogers’ senior Skylurr Patrick, a commit to Purdue University, scored her third goal of the match for a sudden-death victory and the 7A title, 3-2. The contest was played primarily on the Bryant offensive end of the field. The Lady Hornets had 25 shots on goal to 17 for Rogers and had five corners to one for the Lady Mounties. But Rogers’ keeper Mackenzie Brace made nine saves, including a couple by just inches on one-v-one shots from Bryant’s Alyssa Fason in the first half. “From the beginning, this was the goal we had, to get to this final game, to be able to play here, to be able to say this is where we deserved to be,” said Bryant head coach Nicole Inman. “The girls played hard enough this year to get their opportunity to play here. “In the game, if you watched how we played, we had a lot of good opportunities,” she acknowledged. “Sometimes you don’t finish them. Sometimes, you can dominate and have more opportunities on goal and the other team comes away with the win. “We looked like we play soccer and I’m proud of the girls,” the coach asserted. “They worked really hard. I know it’s disappointing but that’s how soccer works sometimes. Rogers had eight shot attempts in the first half but only two were on target and both were saved by keeper Brittney Warner. Fason got past two defenders 12 minutes in that. She got Brace to dive to her left and fired a shot to her right. Brace just got a foot on it to deflect it away. The Lady Hornets had 11 shots on goal in the first half. Patrick had three attempts before intermission but all three were off target. In the second half, Rogers had an attack in the first five minutes only to have Warner come out and smother the ball. Patrick became more assertive but did some flopping against the aggressive Bryant defense. She scored the first goal at the 23:55 mark, dribbling diagonally across the top of the 18-yard box and drawing Warner out. She got by her. Abbey Inman got back to cover the goal but Patrick put it past her. It didn’t take long for the Lady Hornets to answer. At 21:42, Ashton Inman got ahead of a defender on the right wing and fired a shot that bent in to the leftside of the goal beyond Brace’s reach. Warner had five saves including a shot by Patrick at 19:22. The Lady Mounties earned their first corner at the 18:19 mark. Patrick took a shot but it was blocked by Abbey Inman. Later, Rogers attacked and a high shot went off the fingertips of Warner and ricocheted off the cross bar and into the net as the Lady Mounties regained the lead. Patrick was credited with the goal. Again, however, the Lady Hornets responded. With just 10:23 left, Ashton Inman took a shot from the right wing from about 35 feet. Brace got just enough of it to keep it out of the net but, on the back side, there was Jessica Butler to knock it in for the tying goal. “We talk so much about transitional opportunities and just making sure that in the minutes after a goal that we dominate and they did that,” Inman related. The coach was frustrated with the protection Patrick received from the officials. She agreed that the threat took away some of her defenders’ aggressiveness. Both Patrick and Fason had shots in the early going in overtime but they were off target. The Lady Hornets finish the season 17-6 with all but five girls returning next season. “I’m excited about the girls we have coming up,” Inman said. “Our seniors have been great leaders. They’ve been here before, their freshman year. So they knew the pressure. I definitely wanted to play a couple of them just for the leadership opportunities and experience. “I’m very proud of them. I know they’re disappointed. I know they’re sad but hopefully it’ll motivate them for next year,” she said of her underclassmen.